Before we get to how amazingly tasty these tacos are, first a note on deep-frying the fish. The fish is fried here using coconut oil, but you can also use any other healthy fat that has a high smoke point like lard or tallow. The recipe calls for 1-2 cups of oil, which may seem like a lot, but once the oil cools down transfer it back into its container and save it for another frying recipe. Make sure to use a thermometer when heating the oil, the temperature has a lot to do with the final texture and taste of the fish. Too hot and the fish will cook too quickly on the outside and be raw on the inside, and it can also impart a bitter taste. Too low and the fish won’t crisp up nicely and will be soggy. It’s all made easier if you use a deep fryer, but don’t worry if you don’t own one either. We used a deep sauté pan on the stovetop and the fish turned out perfectly. We just made sure to be extra careful with the hot oil and not to leave it unattended at any time. 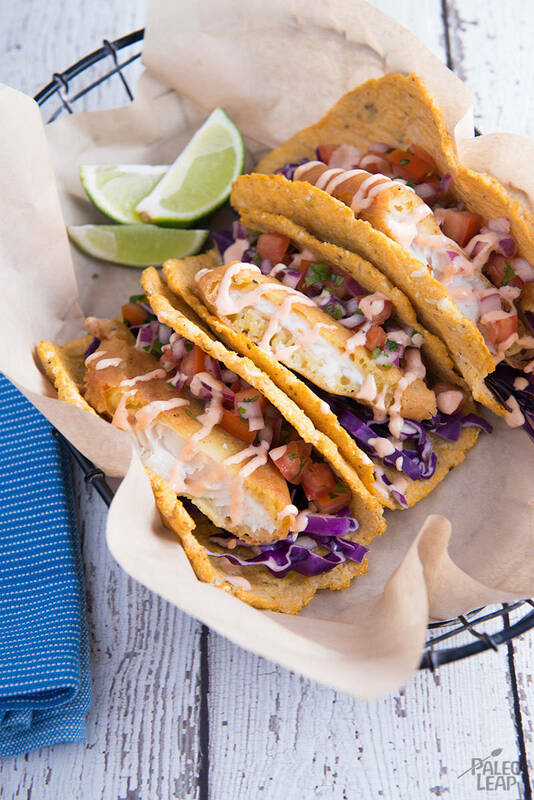 Now for what to expect when you sink your teeth into these amazing tacos. First, if you choose to make the cauliflower tortillas you are at a great starting point, they add a good sturdiness for all the fixings. Lettuce will work as well if want to make a lighter and quicker meal. The fish has a nice crisp crunch on the outside and is tender and flaky on the inside. The cabbage gives you a nice clean and fresh bite where the Pico de Gallo adds some tang and acidity. Then the spicy mayo rounds it all out with a creamy kick. It’s a perfect meal to just sit back, relax, and smile while you eat. For the Pico de Gallo, mix together the tomatoes, onion, jalapeño, and cilantro together. Using a thermometer, heat the coconut oil in a sauté pan until it reaches 345 F. Make sure to keep the oil 5-10 degrees below its smoking point. From this point, be very careful with the hot oil and don’t leave it unattended. While the oil is pre-heating, mix together 3⁄4 cup tapioca starch, coconut flour, eggs, sparkling water, salt and pepper to taste in a large bowl. Place the 1⁄2 cup tapioca starch in a separate medium bowl for dredging.